During the last century the original Treorky Male Choir (it really was spelt that way) claimed two first prizes at the National Eisteddfod and gave a Royal Command performance for Queen Victoria in Windsor Castle. However, massive economic depression and depletion of the membership due to the war caused the choir to be temporarily disbanded in 1943. In 1946 John Haydn Davies became the conductor of the re-formed choir. He imposed his brilliant musical authority on what was basically a group of raw musical recruits, and transformed them into an internationally famous choir. Treorchy continued to gain musical honours at Eisteddfodau by gaining a record eight National wins, making a total of 22 firsts out of 27 competition entries. The 'Treorchy Sound' was soon heard nationally and internationally as the choir made regular radio and television broadcasts, commercial recordings and a feature film, Choirs Of The World. In 1963 the choristers undertook their first overseas tour to Switzerland and were the first Welsh choir to perform in the St Cecilia Concert in the presence of the Queen in the Royal Albert Hall. 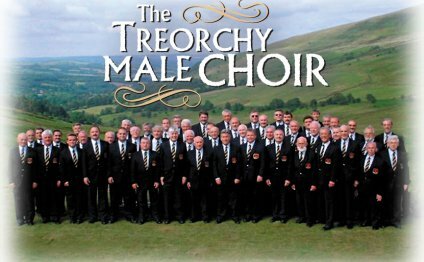 Recognising the profound social changes of the period, Treorchy became the first male choir to venture into the then unchartered territory of popular music, appearing on TV with stars such as Ella Fitzgerald, Julie Andrews, Burt Bacharach, Tom Jones and Sir Harry Secombe. In December 2001, choristers featured alongside singing sensation Russell Watson and teen idols S Club 7 in Cilla Black's Surprise, Surprise. The traditional repertoire remains but alongside it now appears Andrew Lloyd-Webber, Stephen Sondheim, Paul Anka and Freddie Mercury. The choir has made over 50 commercial recordings, making it the most recorded in the UK and arguably, the world. The most recent include Sweet Silver Song, The Best Of Treorchy Male Choir and A Tribute To Wembley with Kenny Ball And His Jazzmen, featuring many popular soccer anthems.